Adam Frith, Larisa Covaciu, and James Lawson have all recently graduated from BA Animation after experiencing perhaps one of the most exciting final years of university that an animation student could wish for. After being approached by TransPennine Express (TPE), who were looking for a series of short animations to show on-board their trains, the students set out on this project with a £10,000 budget. The videos were required to enhance the customer experience on TPE’s new fleet of Nova trains, arriving next year. I sat down with Adam and Larisa, who chatted to me about the phenomenal experience that landed them their first pay-check. Hi guys. Tell us more about the project with TPE. 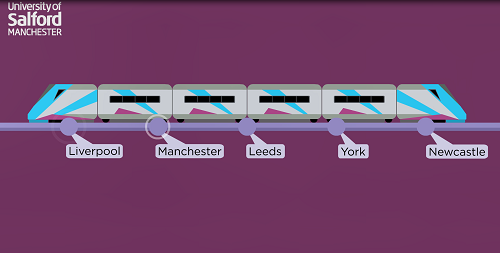 In January, TransPennine contacted the university with a plan they’d had in mind for graphics needed to enhance their new fleet. There was a bit of discrepancy as they initially thought they wanted four animations, however we broke it down and what they were actually looking for was more like 25 animations. We were given two weeks to create a pitch, in which we’d present out ideas for a selection of public information videos. We had thought of multiple concepts, some of which they really liked, which resulted in the company offering to pay us to bring our ideas to life! How do you think taking on this project has helped your career? Obviously TPE are a really big company, so you have that immediate tick on your CV, and for someone who has just graduated, it’s massively helpful! It’s worth mentioning that there’s potential to do more work with them, as we couldn’t do all the work they wanted due to the time window being quite tight. In short, working with TransPennine will certainly make us more employable in the future. How did it feel to work on your first paid project? It was amazing, because we were actually working on something that was real. I know that may sound a little crazy, but this was the first time a lot of us had worked on a professional project that was completely external to our university projects. It taught us a lot about budgeting and how to manage funds when you’re leading a project, which is something that we feel lucky to have experienced this early on. There was a finite amount of cash, and what sometimes felt like an infinite amount of people wanting to work on the project, however all of those who were with us to the very end were really amazing. Do you feel choosing to study at Salford has benefitted you? The facilities at MediaCityUK are world-class, and to complement that, the staff are such a pleasure to work with. The university are very good at listening to what the students want and need. For students such as us who study such a rapidly-evolving course that always requires updated technology and state-of-the-art facilities, we really did feel secure in what we were learning, due to the technology upgrades that are constantly being delivered. It was also great fun! [Larisa] I’d love to be an animation producer, and that’s something that has been really set in stone since starting this project. I love the idea of working in a team with such talented people, and being able to refine a project to be something we’re completely proud of. [Adam] For me, I’ve always wanted to write my own animated show. I came into this degree with a great passion for writing, and felt that animation would be a good course as it would teach me a lot of skills required to run your own projects, like we were mentioning before with budgeting and team managing. The TransPennine Express project leaders. What would be your top tip for any current animation students? Get involved with extra projects! I would controversially advise people to say yes to any project, as well as the projects you ultimately end up being disappointed in or not working well on, because you’ll know not to choose those types of projects, or make those mistakes, in the future. 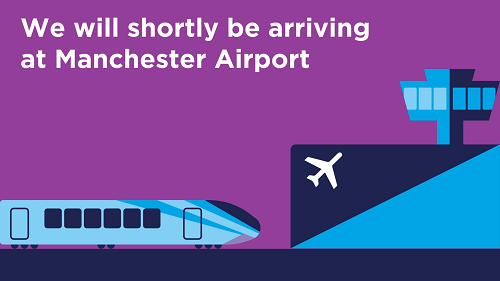 We would just like to say a huge thank you to TransPennine Express for trusting us and accommodating their deadline dates in conjunction with our university hand-in dates. Also, thank you to the University of Salford for organising this opportunity, and of course to all of the fantastic people who worked on the project with us.